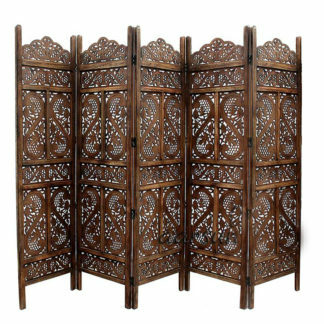 Aarsun Woods promoted to you this Handmade privacy Partition Screen / Room Divider made from premium quality Mango Wood with beautiful floral carvings that gives an elegant and traditional look to your living room. The fold-able 5-Panel room divider is as stylish as it is functional. Create privacy in your room or divide a large, open area into 2 separate spaces with the addition of this endlessly modish piece. This Wooden Room Divider features an intricate mix of gold, hand-painted nature-inspired details that contrast against a sleek black background, sure to add a glamorous and eye-catching new decorative accent to your space. 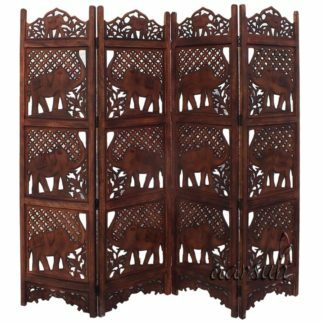 Each Portion consists of a beautifully carved “S” Pattern Design in Front surrounded by Floral Carvings which runs on the whole unit.The 5-Panel partition Screen is crafted from solid wood and measures 72 inches height and 20 inches width. This piece will easily enhance existing decor in your Mediterranean or transitional styled home. The Wooden Room Dividers / Partition Screens is hand-carved from premium quality Mango Wood. Color: Heartwood or the core of a mango tree wood is usually golden brown though it may also be yellow or have pink and/or black streaks. We provide shipping to all parts of India. the packaging of the unit is done in Wooden Crate Boxes so as to avoid any damage while in-transit. We provide best possible services to all our clients and believe in strong customer relationships.The Partition Screen / Room Divider can be extended in Length as more panels can be added as per your need. Contact us for customization and other details.